Another icon of St. George, this time in the town of Larnaca, seems to be gushing myrrh. According to information, the frescoed icon of St. George the Trophy-bearer from 1853/4, in the katholikon of the Sacred Monastery of Saint George in Larnaca, on the outskirts of the city, is gushing myrrh. This happening was revealed by Metropolitan Chrysostomos of Kition, who celebrated yesterday morning the inauguration of the renovated Monastery of Saint George in Kontos, on the occasion of the transferred feast of St. George the Trophy-bearer. His Holiness stressed that there was a strong fragrance in the church that was so intense that they were forced to open the windows to continue the Divine Liturgy. It was then discovered, after an investigation, that the fragrance came from the historical icon and showed three points from where the myrrh gushed. It is worth noting that the work in restoring and renovating the interior and exterior of the historic Monastery of Saint George in Kontos near Larnaca lasted about two years. On its location was established the Orthodox Cultural Center of Saint George, at the restaurant which offers daily meals to hundreds of unemployed and homeless people of the city who are in urgent need. We recall that a corresponding appearance of myrrh also appeared on the icon of St. George on Pascha Monday, in the community of Kambi in Farmaka. This icon was painted in the 15th century and repainted in 1624, and has particular hagiographic value. 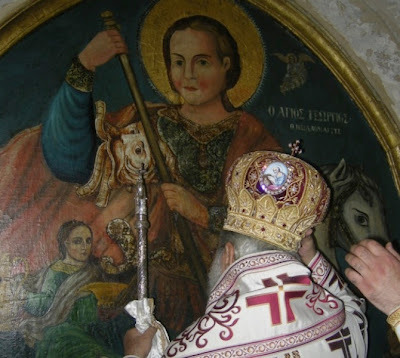 It depicts St. George and is found in the church of the community named after the Saint. The Metropolitan of Tamasos immediately brought experts and examined the icon, apparently finding no natural cause for the phenomenon. According to the testimony of locals, "the icon of St. George gained weight rapidly during the procession and it took six men to lift it with great effort. After prayers before all the people a great amount of tears of myrrh began to flow and it was giving off a fragrance."